Proprietary Name: Hidex 6-day What is the Proprietary Name? Hidex 6-day with NDC 15014-211 is a a human prescription drug product labeled by Gentex Pharma. The generic name of Hidex 6-day is dexamethasone. The product's dosage form is tablet and is administered via oral form. HiDex contains dexamethasone tablets USP, 1.5mg for oral administration. Each tablet contains anhydrous lactose, croscarmellose sodium, magnesium stearate, microcrystalline cellulose and stearic acid. In addition, the 1.5 mg tablet contains FD&C Red #40.HiDex 6-Day contains dexamethasone, a synthetic adrenocortical steroid, is a white to practically white, odorless, crystalline powder. It is stable in air. It is practically insoluble in water. Glucocorticoids, naturally occurring and synthetic, are adrenocortical steroids that are readily absorbed from the gastrointestinal tract. Glucocorticoids cause varied metabolic effects. In addition, they modify the body’s immune responses to diverse stimuli. Naturally occurring glucocorticoids (hydrocortisone and cortisone), which also have sodium-retaining properties, are used as replacement therapy in adrenocortical deficiency states. Their synthetic analogs including HiDex 6-Day are primarily used for their anti-inflammatory effects in disorders of many organ systems. At equipotent anti-inflammatory doses, HiDex 6-Day almost completely lacks the sodium-retaining property of hydrocortisone and closely related derivatives of hydrocortisone. HiDex 6-Day suppression test (DST): False-negative results in the HiDex 6-Day suppression test (DST) in patients being treated with indomethacin have been reported. Thus, results of the DST should be interpreted with caution in these patients. Hepatic Enzyme lnducers, Inhibitors and Substrates: Drugs which induce cytochrome P450 3A4 (CYP 3A4) enzyme activity (e.g., barbiturates, phenytoin, carbamazepine, rifampin) may enhance the metabolism of corticosteroids and require that the dosage of the corticosteroid be increased. Drugs which inhibit CYP 3A4 (e.g., ketoconazole, macrolide antibiotics such as erythromycin) have the potential to result in increased plasma concentrations of corticosteroids. HiDex 6-Day is a moderate inducer of CYP 3A4. Co-administration with other drugs that are metabolized by CYP 3A4 (e.g., indinavir, erythromycin) may increase their clearance, resulting in decreased plasma concentration. Phenytoin: In post-marketing experience, there have been reports of both increases and decreases in phenytoin levels with HiDex 6-Day co-administration, leading to alterations in seizure control. 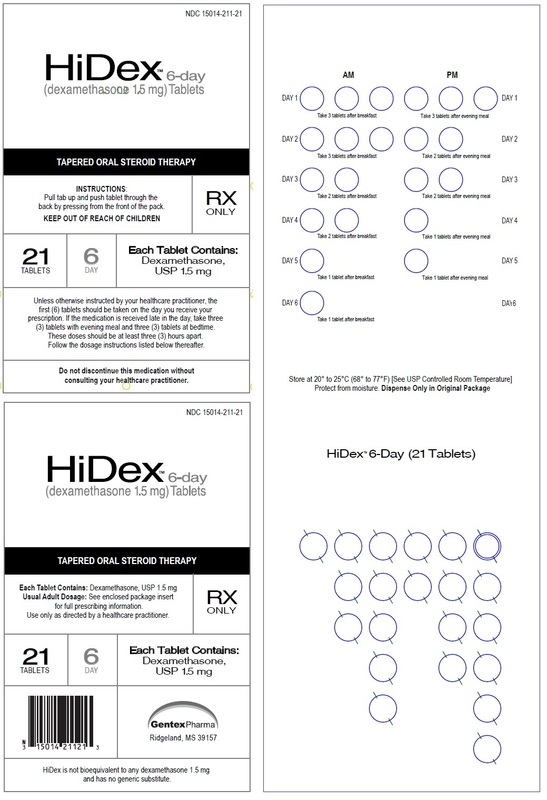 Usual Adult Dosage: See enclosed package insert for full prescribing information.Use only as directed by a healthcare practitioner.HiDex is not bioequivalent to any dexamethasone 1.5 mg and has no generic substitute.TAPERED ORAL STEROID THERAPYINSTRUCTIONS:Pull tab up and push tablet through the back by pressing from the front of the pack.Unless otherwise instructed by your healthcare practitioner, the first (6) tablets should be taken on the day you receive your prescription. If the medication is received late in the day, take three (3) tablets with evening meal and three (3) tablets at bedtime. These doses should be at least three (3) hours apart. Follow the dosage instructions listed below thereafter.Do not discontinue this medication without consulting your healthcare practitioner. Systemic fungal infections (see WARNINGS, Fungal Infections).HiDex 6-Day tablets are contraindicated in patients who are hypersensitive to any components of this product. For oral administration: The initial dosage of HiDex 6-Day varies from 0.75 to 9 mg a day depending on the disease being treated.It Should Be Emphasized That Dosage Requirements Are Variable And Must Be Individualized On The Basis Of The Disease Under Treatment And The Response Of The Patient.After a favorable response is noted, the proper maintenance dosage should be determined by decreasing the initial drug dosage in small decrements at appropriate time intervals until the lowest dosage that maintains an adequate clinical response is reached.Situations which may make dosage adjustments necessary are changes in clinical status secondary to remissions or exacerbations in the disease process, the patient’s individual drug responsiveness, and the effect of patient exposure to stressful situations not directly related to the disease entity under treatment. In this latter situation it may be necessary to increase the dosage of the corticosteroid for a period of time consistent with the patient’s condition. If after long-term therapy the drug is to be stopped, it is recommended that it be withdrawn gradually rather than abruptly.In the treatment of acute exacerbations of multiple sclerosis, daily doses of 30 mg of HiDex 6-Day for a week followed by 4 to 12 mg every other day for one month have been shown to be effective (see PRECAUTIONS, Neuropsychiatric). In pediatric patients, the initial dose of HiDex 6-Day may vary depending on the specific disease entity being treated. The range of initial doses is 0.02 to 0.3 mg/kg/day in three or four divided doses (0.6 to 9 mg/m2body surface area/day). For the purpose of comparison, the following is the equivalent milligram dosage of the various corticosteroids:HiDex 6-Day, 1.5 Methylprednisolone, 8 Predisone, 10 Triamcinolone, 8 Prednisolone, 10 Betamethasone, 1.5 Hydrocortisone, 40 Paramethasone, 4 Cortisone, 50These dose relationships apply only to oral or intravenous administration of these compounds. 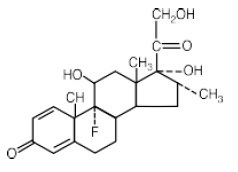 When these substances or their derivatives are injected intramuscularly or into joint spaces, their relative properties may be greatly altered.In acute, self-limited allergic disorders or acute exacerbations of chronic allergic disorders, the following dosage schedule combining parenteral and oral therapy is suggested: Dexamethasone Sodium Phosphate injection, USP 4 mg per mL:First Day1 or 2 mL, intramuscularlyDexamethasone Tablets, USP, 1.5 mg, one-half tablet:Second Day2 tablets in two divided dosesThird Day2 tablets in two divided dosesFourth Day1 tablet in two divided dosesFifth DayOne half tabletSixth DayOne half tabletSeventh DayNo treatmentEighth DayFollow-up visitThis schedule is designed to ensure adequate therapy during acute episodes, while minimizing the risk of overdosage in chronic cases.In cerebral edema, Dexamethasone Sodium Phosphate injection, USP is generally administered initially in a dosage of 10 mg intravenously followed by 4 mg every six hours intramuscularly until the symptoms of cerebral edema subside. Response is usually noted within 12 to 24 hours and dosage may be reduced after two to four days and gradually discontinued over a period of five to seven days. For palliative management of patients with recurrent or inoperable brain tumors, maintenance therapy with either Dexamethasone Sodium Phosphate injection, USP or Dexamethasone tablets in a dosage of 2 mg two or three times daily may be effective.Dexamethasone suppression tests:Tests for Cushing’s syndrome.Give 1 mg of Dexamethasone USP orally at 11:00 p.m. Blood is drawn for plasma cortisol determination at 8:00 a.m. the following morning. For greater accuracy, give 0.5 mg of Dexamethasone USP orally every 6 hours for 48 hours. Twenty-four hour urine collections are made for determination of 17-hydroxycorticosteroid excretion.Test to distinguish Cushing’s syndrome due to pituitary AGTH excess from Cushing’s syndrome due to other causes.Give 2 mg of Dexamethasone USP orally every 6 hours for 48 hours. Twenty-four hour urine collections are made for determination of 17-hydroxycorticosteroid excretion.